On Friday and Saturday nights, during the mid 1960s, me and a group of friends would meet at the Bath Arms, in The Lanes for a night out. I remember what I wore in those, ‘pre mod’ days. I had a black, short plastic mac, from an army surplus store, bright red ‘ankle swingers’ – hipster jeans that were short in the leg, a white tee shirt, white socks and Hush Puppy shoes. Me and my friends must have looked a sight, during a period in which adults wore very ‘grey’ sorts of clothes. As is the way with these things, ankle swingers are back in fashion, although minus the white socks. In fact, minus any socks. We would have about three pints of beer, in the Bath Arms and move on to a pub that was behind the Hippodrome. I have forgotten its name but it was remembered for serving Merrydown cider – the only place we ever found it sold. I seem to remember that it was only sold in half pints. Only one half pint was necessary to make us fairly drunk, given the beer that we had drunk. The beer I slowly learned to miss was Barley Wine. It was very potent and made me very sick. Most of this drinking took place when we were 16 or 17. Perhaps we all looked much older. I hope not. Regular haunts, after having had quite a few drinks, were the Starlight Rooms and the Florida Room. Both of these have been described, before, on this site. The Starlight Room pretty much existed for dancers. The Florida was for listening to blues bands and other visiting outfits. Dancing there was limited because of the size of the crowd. Most of us, as Mods, would dance The Block. It was a fairly simple dance, that involved a lot of kicking out of legs. Today I suspect it might be called Dad Dancing. How did we get home? We loved it and if there were no girls to dance with, we danced with each other. We left, regularly, to top up our alcohol levels; usually with double whisky and Coke. Some of the best times for dancing were on Marine Parade, during the very early Brighton Festivals. Lots of bars were open and it was wonderful to dance in the open air and in the middle of the road. How we got home is a mystery. 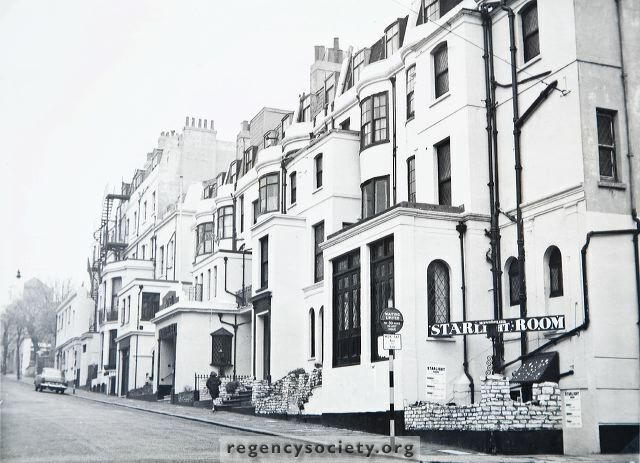 Nice to see a photo of the Starlight and adjacent houses before they were demolished and replaced by the hideous block of flats that are there today. How ever did they get away with it? Philip, the pub you recall that sold Merrydown cider was called the Full Moon in Boyces Street. It was a very cheap drinking hole and there used to be some characters who drank and drank in there as it was so cheap. The cider was graded sweet, medium cloudy and cloudy, in increasing strengths. It says it all. It did become gentrified and it is now a restaurant.